Today we are having a look at a LED-laden, gaming-focused, ATX motherboard from GIGABYTE: the Aorus AX370-Gaming 5. If a user wants LEDs for Ryzen at under $200, here is one of the primary contenders. 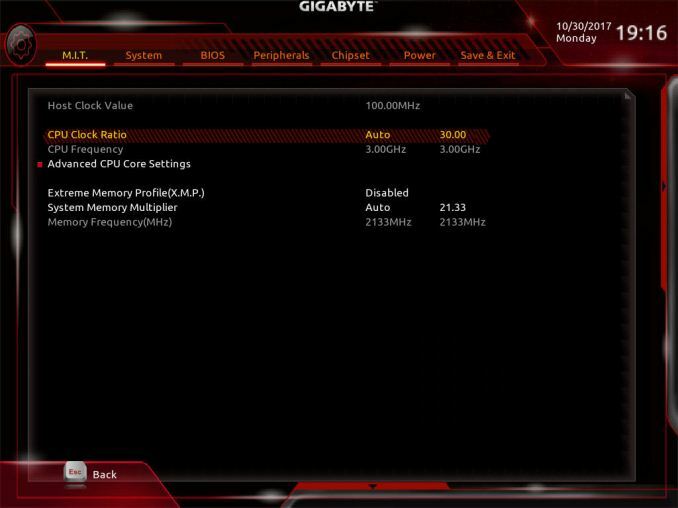 Being part of GIGABYTE's gaming product line means we get SLI support, and GIGABYTE is using a gaming-focused network controller (one of two) and some overclocking options for the processor. The interesting part of this board, however, is the use of dual audio codecs: one for the rear panel and one for the front panel. To physically do this requires a couple of compromises, so we have put the board through its paces to see if it is worth buying. 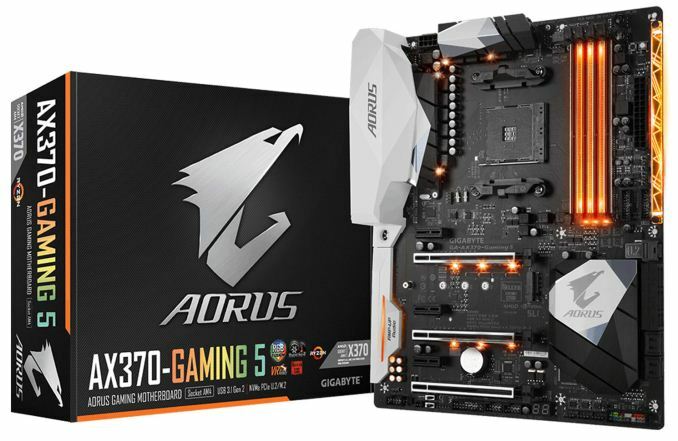 The GIGABYTE AX370-Gaming 5 shows that not every motherboard has to conform to the regular gaming themed combination of black PCB with red or silver aluminium heatsinks. 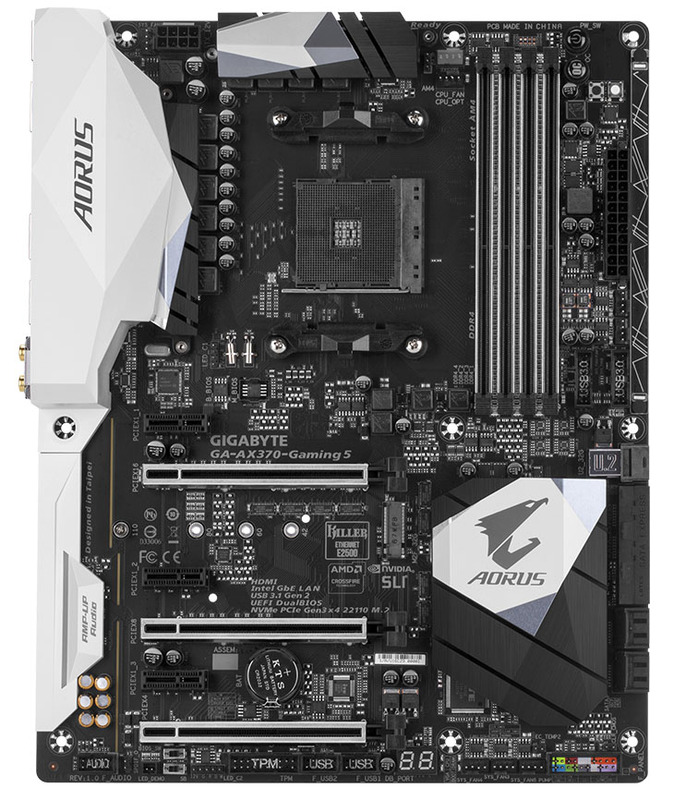 With the Gaming 5, it has a wave of black and white contrasting heatsinks featured across the board. GIGABYTE has opted to implement a fairly standard X370 PCIe layout consisting of two full-length PCIe 3.0 slots powered by the CPU, which feature support for dual graphics card configurations on either SLI or CrossFire and have additional rigidity support. This is in addition to a single full-length slot present at the bottom which operates at PCIe 2.0 x4 also with rigidity support, and three PCIe 2.0 x1 slots. It gets a little interesting when we start discussing the controllers. Powering the onboard audio are a pair of Realtek ALC1220 codecs, with one dedicated for the back panel and one specifically for the front. Very few boards (if ever?) have had this arrangement, making the Gaming 5 special in that regard. The audio comes bundled with SoundBlaster’s X-Fi MB5 software utility. For networking, the primary port is derived from the gaming-focused Killer E2500 Gigabit controller, and a second from an Intel I211-AT controller. Featured is a 10-phase power design, which GIGABYTE aims for solid and consistent power delivery, and claims it is useful for overclocking. It is worth noting that the VRM is split into a 4+2 design with the phases dedicated to the SoC using a doubler to give an 8+2 phase design overall. Storage wise, the Gaming 5 has eight SATA 6Gbs ports which are accompanied by two SATA Express ports. PCIe storage comes via a single U.2 port, which shares bandwidth with a single M.2-2280 slot found between the first two full-length PCIe slots. Performance on the Gaming 5 essentially matches what we see on the other X370 boards. Despite the dual audio codecs, this means that each codec only has half of the space, so our audio results show that it is one of the weaker ALC1220 solutions (although better than the ALC892 units we have tested). Power consumption at idle was within a couple of watts of our other boards despite the LEDs, and at load the system actually drew 15W less than our other tests, to which we're still looking into an explanation. Overclocking, as explained below, was relatively easy. The Gaming 5 sits near the top of the pile of GIGABYTE's current X370 offerings, with the only model above it being the AX370-Gaming K7. It is also worth noting that GIGABYTE's X370 range stops just short of $200 even with their top AX370-Gaming K7 model; with the very similar AX370-Gaming 5 which this review is actually on coming in at $184 (at the time of review). Most, if not all, mid-range motherboards are very capable of overclocking the processor, and most include a one-click OC button (either physical or in the BIOS) which gives the task to the motherboard based on how far it believes it can be done safely. The only caveat of this is that virtually every motherboard I have used this with is very cautious about not giving enough voltage, so over-volts the CPU. This gives the overclock more chance to remain stable, but plays havoc for little gains at the price of extra energy lost as heat; thermal sensors can start to kick in even if the auto-option is safe. With the Gaming 5, both automatic overclocking and a manual overclocking is available. 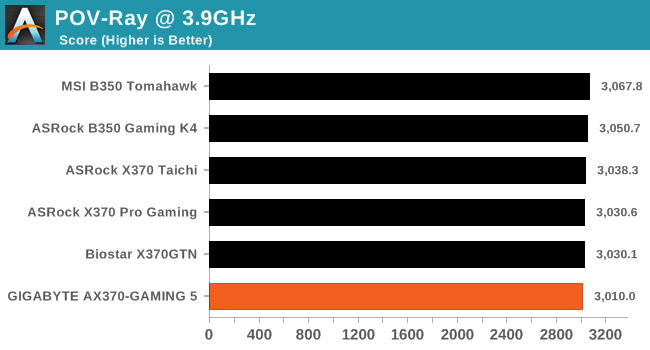 Referencing back to the Biostar X370GTN review, our Ryzen 7 1700 CPU does have a limitation between 3.9GHz and 4.0GHz; at least on the boards we have tested thus far. This is down to silicon lottery and a combination of a sharp ramp of voltage to temperature when moving up each different step; therefore, cutting out/throttling due to thermal limitations when pushed too far on ambient cooling. The Ryzen 7 1700 processor we are using has a 3.0 GHz base core clock speed and a 3.7 GHz turbo, and is rated at 65W. When overclocked to 3.9 GHz with 1.375v, the overall power consumption taken at the wall was pushing just under 187W at peak. I also think there should be some USB transfer tests and LAN NIC tests as well. Nothing too complicated, just large file transfer speeds, photo files and a set of small diverse files. One is dedicated to the back and one to the front.